At the prior post, you learned how to create routes. But, Where are your vehicles and drivers and what's happening with your deliveries? The first you'll see is your vehicles at the left of the screen, with their respective drivers, and the map at the center of the screen. As soon as one of your drivers' login into the mobile app, you'll see a circle on the map indicating his/her location. You can click on a vehicle to see its specific route. Once the route of a vehicle is open, you'll see all the visits of its route, its GPS location and the status of each delivery. As the day goes by, some deliveries will change to green (successful deliveries) and some will change to red (failed deliveries). If you click on any visit you can see more information. On each visit's detail window you'll see the comments the driver typed in, the time the driver visited that place, and the pictures he or she took. You can download the pictures to your computer if you need it. While you check on the web what your drivers are doing, they will be using SimpliRoute's mobile app. They can download the app on Google's Play Store, or through this link. 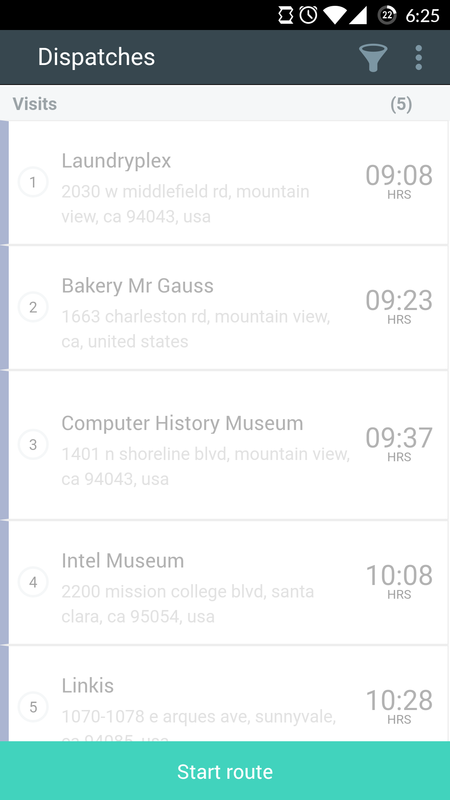 On the mobile app, your drivers will see the list of places they have to visit. To start, the driver must click on Start Route. The list shows the driver which places he/she has to visit and at what time they should be arriving approximately. Every visit he/she registers will change to green if it was successful or red if it was failed. The driver can click on any visit to see more details. 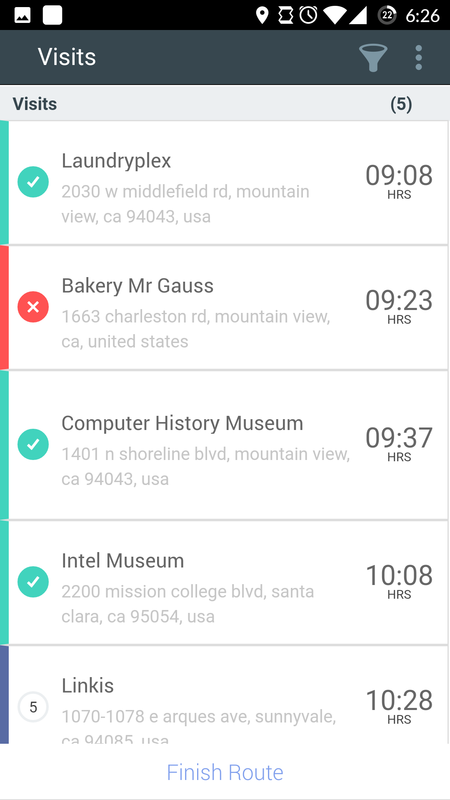 Inside each visit is the detail that you entered when you created the routes, like at what time can that customer be visited, or who is the contact person and which is his/her phone number. With the blue button, the driver can ask for indications on how to get to the destination using apps like Waze or Google Maps. The driver can report how did the delivery go. If he/she was able to deliver the package or if something failed. 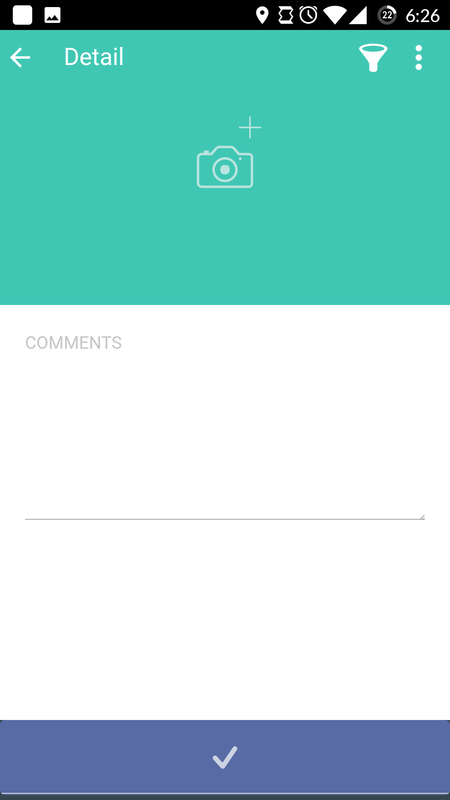 For each visit, he/she will able to put some comments and take pictures. The app will save the time and the place where the visit occurred once the driver clicks on the blue ticket. 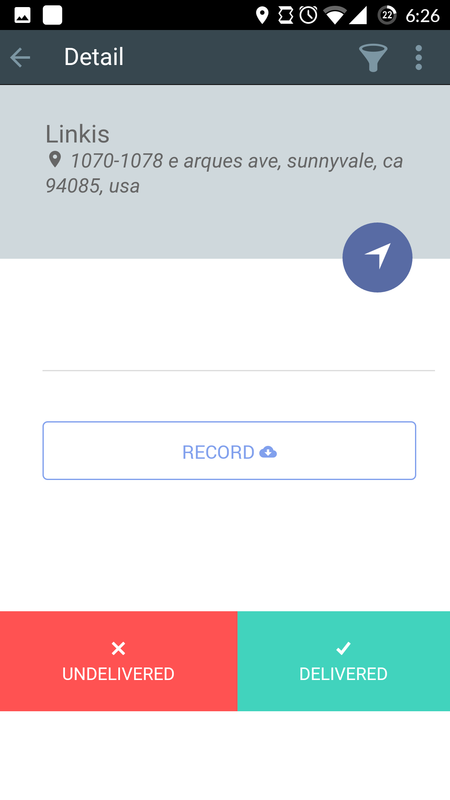 Each time a driver reports something, you'll be able to see it on the tracking web app on your computer in real time. For further questions on how to use SimpliRoute send an email to contact@simpliroute.com.